Our welders have experience in TIG welding stainless steel and aluminum, as well as pulse MIG welding of stainless steel, aluminum and mild steel. 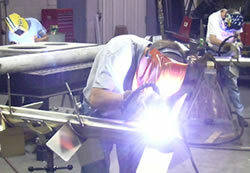 We also do MIG & Flux Core welding of stainless steel and aluminum; as well as projection and spot welding up to 75 KVA. Our expertise allows us to produce every product to your exactly defined specifications and requirements.